The diet makers and nutritionists who have been laying out the optimal health rules over the years have gotten it wrong, and we’ve paid the price big-time. We are sicker than ever, even with the calorie-cutting strategies and fatigue-inducing workouts that have taken over our lives. Sadly, we continue to let outside “experts” control us by believing whoever makes the greatest promise and buying the products they provide. Until now! 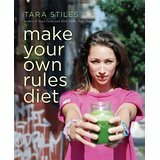 In Make Your Own Rules Diet, Tara Stiles introduces you to the most knowledgeable expert on your health: YOU. She throws out the accepted “rules” and helps you tune in to yourself, so you can figure out what truly makes you feel good. The moment you make this shift is the moment you take back your power and begin to make choices that actually support you.